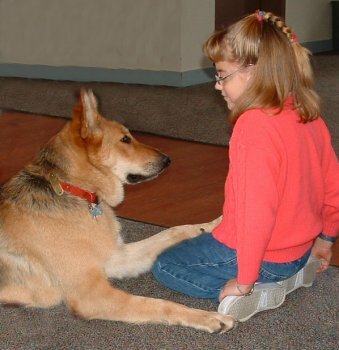 The touching true story of an assistance dog who becomes a special friend for a young girl with cerebral palsy. Eight-year-old Cecily was born prematurely, and as a result, lives with Cerebral Palsy. She has trouble with balance, walking long distances, and picking up dropped items. Other than that, she is just like every other young girl. She likes to read, laugh, play with her brothers and sisters, help take care of new baby brother, and go to the park. However, she has never been able to be 'just like every other young girl' because she is not always accepted by her peers, and certainly not able to keep up with their play. Her family is wonderful, and her siblings supportive and inclusive. Still, she often yearned for her own 'special friend'. She knew, even at her young age, that she was 'different'. And she was painfully aware that the things that made her different also put up a barrier between her and other children her age. With a wisdom that comes only from 'being there', she also knew that those 'differences' were not going away. Still, she wished there was some way those differences could attract positive attention rather than negative. In addition to the social and emotional challenges Cecily lives with, she also has to rely on others to help her with just about everything physical. Somebody needs to be close by at all times in case she falls. She needs someone to retrieve a forgotten crutch, or pick up her crayon if she drops it; she can't go into the bathroom by herself because her balance is so bad. It is an extra challenge for everyone, although they love her and love helping. And it was most especially hard on Cecily's own self-esteem. Even a six-year-old wants to be able to go to the bathroom by herself, or pick up her own crayon to keep coloring. Cecily's parents were aware of dogs who helped people with disabilities but were unsure whether this would apply someone Cecily's age. In 2005, however, they discovered Summit Assistance Dogs in Anacortes, Washington. Summit doesn't have an age restriction and had already placed a dog with a four-year-old just a few years before. So Cecily applied, was accepted by Summit, and then began the wait. Unfortunately, the demand for assistance dogs is so much greater than their supply that too often the wait is five years or more. For anyone that is a long time, but for a child it can seem like a lifetime. 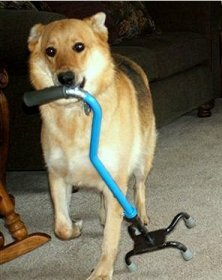 For months, as the family waited and hoped, they kept their spirits up by joking that a service dog for Cecily should be named 'Somebody' because often, when Cecily needed help, she yelled, "Somebody, I need my cane" or "Somebody, I dropped my crayon!" 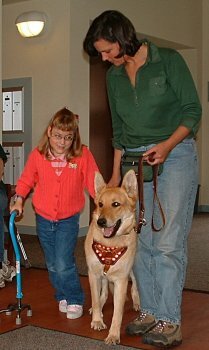 who was nearing the end of her training as a mobility assistance dog was deemed by the Summit training staff as the quintessential 'child's dog'. In addition, Tasha had proven herself able and willing to learn how to do the specific tasks that Cecily needed. Needless to say, Cecily and her family were overjoyed when they got the call about Tasha, even if her name was not "Somebody"! Hearing that Tasha was available was only the beginning, however. 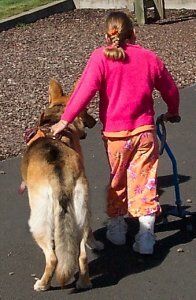 Learning to work with a service dog is a tough road to travel for anyone, but even more so for a child. And for the parents, it always results in more work. 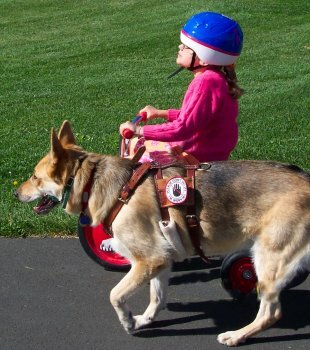 A dog is very much a child, forever, so adding 'another child' to a household already dealing with the challenges of caring for a child with disabilities is something that must be seriously contemplated. Cecily's family, however, was willing to put in the extra effort and work in the hopes that Cecily's life would be improved. "I remember the first day of team training. Cecily walked in with her mother and grandmother, looking a little nervous. When we introduced her to Tasha, she hesitantly raised her hand to pet her. When we asked her to give Tasha a treat, she gagged as Tasha licked the treat away. The look of shock and dismay on her mom's face was apparent. They had been waiting so long for a dog, they were finally here, and now it seemed that Cecily may not be ready!" But the next day things looked up: Cecily came in wearing her favorite cowboy hat, just for Tasha. And she brought a present for Tasha as well: a blue, stuffed dog. She put the little dog in Tasha's basket, and Tasha laid her head on it. "In their first week home, we received an email from Cecily's mom. She told me that for the first time in her life, Cecily went out to the back yard to play by herself, with Tasha. Tasha had provided that needed confidence." "On my summer visit with Cecily and Tasha, Cecily's mom said we had to go to the park. Once there, I witnessed the most amazing thing. We went over to the slide. Cecily and Tasha went up the ramp. Tasha went down the slide, waited for Cecily to slide down, and then assisted her over to the ramp to do it again. Cecily's mom writes often to tell us of their blossoming relationship." Cecily finally has her best friend and the other children are clamoring for more 'Tasha time'. They are amazed, impressed, and even a bit jealous when Tasha picks up Cecily's dropped crayon or brings her one of her crutches. After all, who has such a beautiful, loving, and talented dog as their best friend? Deborah Hall is the co-author and publisher of The Rainbow Series: Dogs Who Help. Deborah explains, "This is an on-going series of nonfiction children's books, some sprinkled with a bit of fantasy here and there, about real dogs who help others in various ways. These books appeal to children from pre-school through fifth grade. Because they are nonfiction and illustrated with color photographs of the actual dogs in action, they educate as well as entertain. 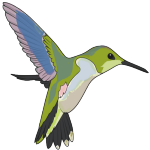 They encourage children to learn to read and love it, and all have at least one important life 'lesson' about diversity, acceptance, love, and animal stewardship. 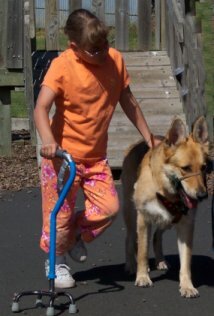 For more information about Summit Assistance Dogs, visit www.SummitDogs.org.